I am really loving my time in Greece. 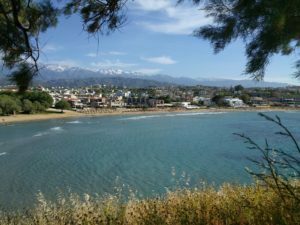 This area I am in along the coast North of Athens and across the sea from the island of Alonissos is very healing country. It is called the Pelion. Today I am writing from Kissos again. I am back near the KaliKalos community I was with earlier, but up a very steep hill staying with a friend, Sylvia who is also a naturopathic doctor, trained and licensed in Germany. There is no Wifi in her home, so I use the KaliKalos wifi when I am in the area. 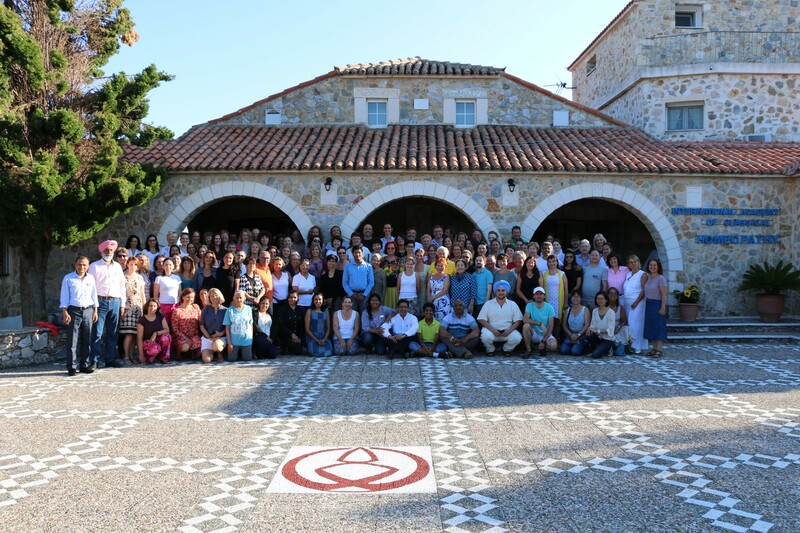 Last week I finished the homeopathy course with Vithoulkas at the International Academy of Classical Homeopathy. I made some great new friends and learned some new things about homeopathy. It is wonderful to see a master at work. 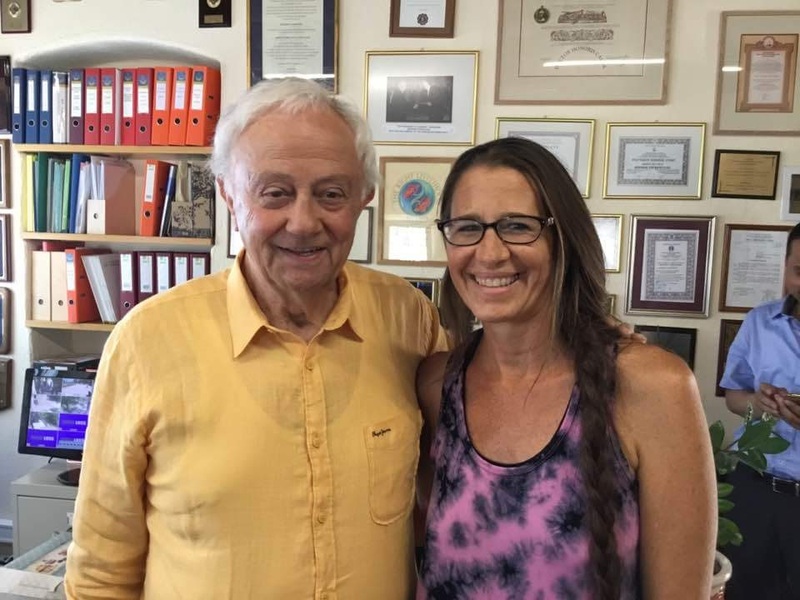 Here is a photo of my friend, Whittni with Professor Vithoulkas. He looks pretty good for 84 years old! I took the ferry for 4.5 hours to Volos. The ride was beautiful and the sea is very flat, no real waves and the ferry was huge but not very full. We passed by the island of Skopelos where the church on the hill is from the movie Mama Mia. It was nice to come back to a known area – where I know my way around and know many of the people. It has been a great place to connect with people of common ideas and interests. I have decided to stay until June 21st when I head to Sofia, Bulgaria. Today I went on a hiking tour where we visited several different villages, walking on mule paths, walking paths, streets, up and down, very little of it flat. I met a new friend, Antoinette, from South France. I am interested in touring some of the areas specific to Mary Magdalene in the South of France. I had just a few days ago committed on my calendar to visiting that area before I go to Paris. I had read a book awhile ago, but wondered how I was going to make a good plan for visiting. Today I felt like meeting Antoinette was an answer to my prayer! She might even travel with me around the area. Sylvia is planning on spending the winter in India and is encouraging to come for a couple of months. A friend, Ann, is encouraging me to see New Zealand while I am in the travelling mode, she says the North Island is not to be missed. I am still planning on coming back to the states the end of August, but considering whether I might want to extend travelling before I really settle down in Ashland with a house and business again. Travelling seems to be agreeing with me! This entry was posted in Blog on June 12, 2017 by DrValeria. 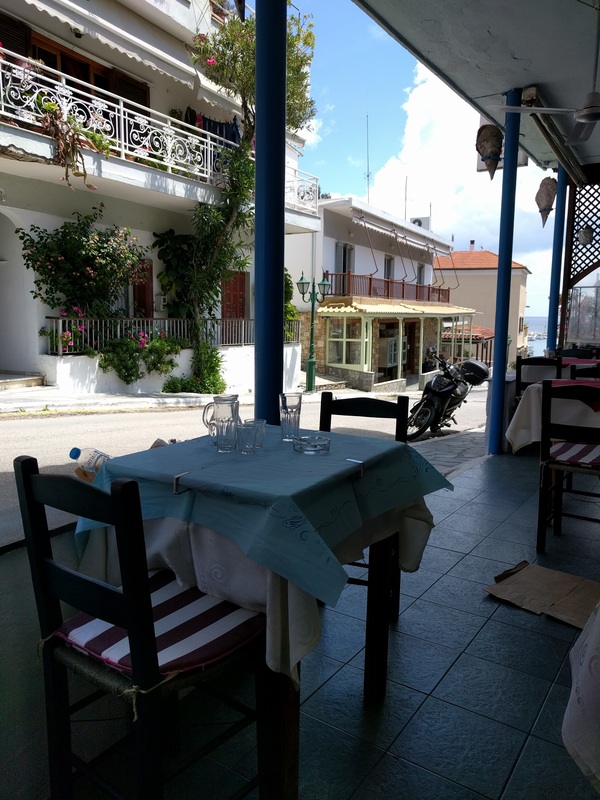 Today is Saturday, May 27th and I am writing from my Air BnB on the island of Alonissos. Getting to the island was quite amazing. I had an opportunity for a ride down to Volos where I needed to catch the ferry (the day before I thought I needed to catch the ferry). I had already bought the ferry ticket online a couple weeks ago. Adam suggested I just go down to the ferry and see if I could get on a day early, rather than get a hotel in Volos. When I went to the ferry, they looked at my ticket and pointed out that the ticket was good for that day! I had forgot what day I bought the ferry ticket for. If I had come down the following day I would have had to buy another ticket! The angels are watching out for me. It takes a lot of focus to travel by your self – nobody else to double check you. The ferry ride was so smooth, I couldn’t tell the difference between being in port and moving along the sea. 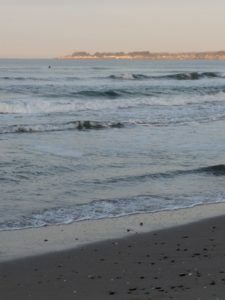 The sea has been very calm, like the waves on a large lake. 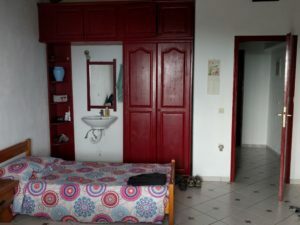 My Air BnB on Alonissos was glad to accommodate me coming early. Amy picked me up at the ferry. I joined the family for dinner, it was quite nice. This is the sea view sitting on the little patio adjoining my room. The course at the International Academy of Classical Homeopathy, with George Vithoulkas, begins on Monday, takes a break next weekend, then finishes up the following week. The teaching and notes are using the Vithoulkas Compass software, which I have not used before, so I am spending some time this weekend learning it. I needed the wifi here to be able to use the program. My landlady helped me negotiate a vehicle to get to and from class with. We will go late into the evening and it is quite a walk from where I am on top of this hill in the country. I first wanted a scooter, but the one her friend, Nicco, had to rent was like a big motorcycle and I could hardly get it on and off the stand. 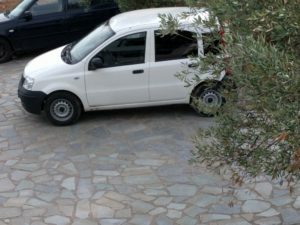 Nicco thought a small Fiat car would be better for me and gave me a deal for the 12 days I am here – 200 Euro which is $223. It is a five speed. I am a little rusty on using a clutch after having the Prius for 8 years, but I am doing fine. 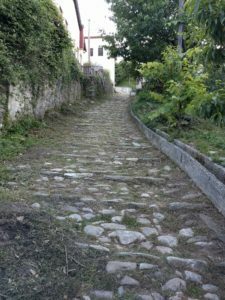 The roads on the island go every which way are very steep and narrow and the signs are small and confusing in the Greek alphabet – so I have made lots of explorations and turning around. Driving by myself on a Greek island is not anything I really thought I would be doing, but I am getting better every day. In 10 days I will be a pro. I remind myself it is an adventure. 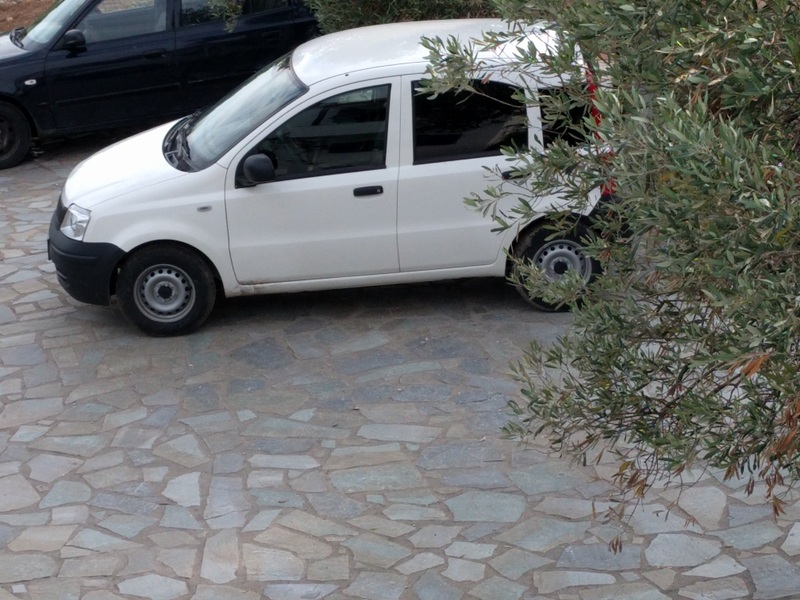 This is my little white Fiat in the driveway of the house I am staying. Today, I went grocery shopping and to lunch in the nearby town of Patitiri. I met another homeopath, Abby, from Australia, we sat out on the patio on the street for lunch. As you can imagine we had a lot in common. She traveled four days to get here from Australia. This is from our table. I’ve appreciated your well wishes for my toes. 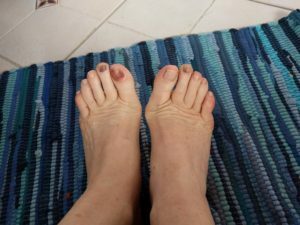 They are starting to look like I have a strange toenail polish on them. They don’t hurt, and the nails are not loose, so I think all is well, just look strange. I am feeling glad I came a little early to get settled. I am also excited to be able to study here after 20 years of wishing I could come to this yearly May class in English. As Abby and I said today – it takes a dedicated homeopaths to get here! I am thrilled I made the trek. This entry was posted in Blog on May 27, 2017 by DrValeria. The work continues to reclaim this old house and grounds after being empty all winter. I have been primarily working on setting up the Round House – wood frame, canvas top, bamboo blind walls. It is about twenty feet in diameter. 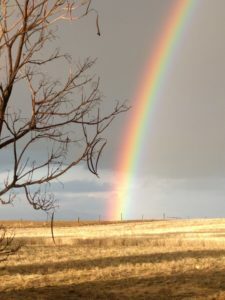 We had several days of cold weather and rain. The Round House is used for larger meetings and its roof is leaking and bamboo blinds needed repair. I dug a ditch today to redirect water from the roof. It was sunny today, but the ground was still soft from the rain yesterday. Our dining area is gorgeous outside under grape vines and kiwi vines, so when it is raining we get food in the kitchen and sit around the house lobby area. It usually does not rain much after the first of June when the retreats start, so they are hoping for the best. It is definitely warmer when the sun is out! 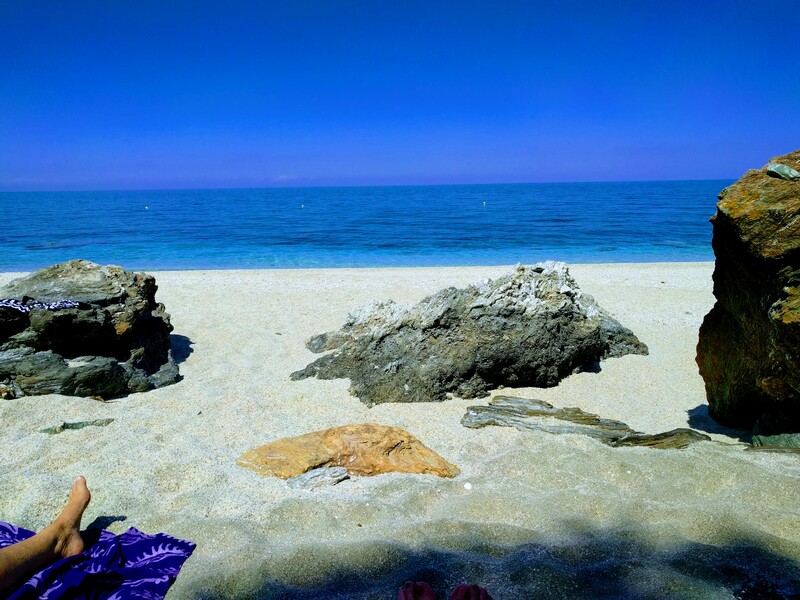 Here at Kissos we are about 1600 feet above sea level, then in the afternoons we drive about 20 minutes down to the sea for a swim and shopping, then come back to work before dinner at 7:30. Everybody does some part of cooking and clean up for the meals in addition to the work we are doing to get things set up for the conference starting June 1. 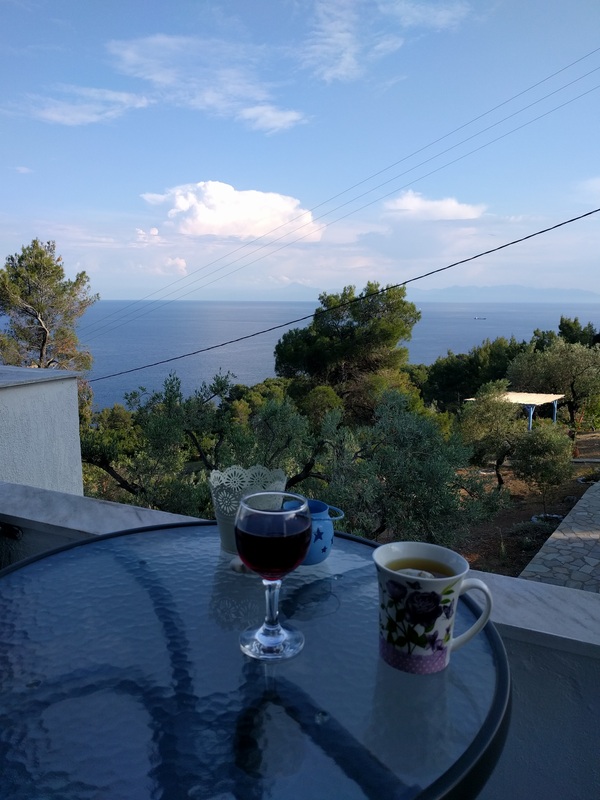 I will leave this Friday, May 26th before it all gets set for my homeopathy conference on the island of Alonissos. I can see the island from the beach we go to in the afternoons. 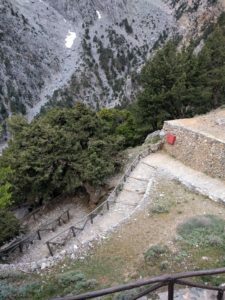 I am pleased to be able to walk quickly up and down stairs again, it took a week to recover from sore muscles after the Samaria Gorge hike. 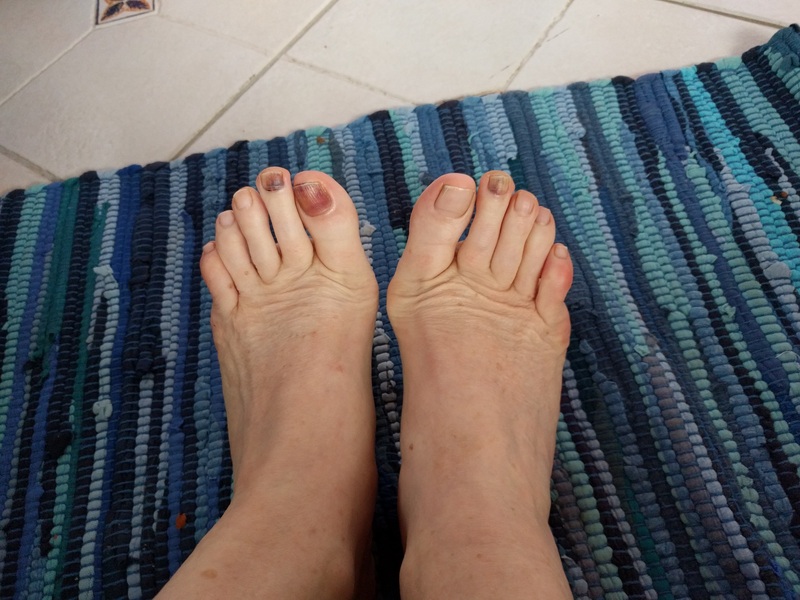 Three of my toenails are colored purple underneath from being jammed in my boot coming down so steep a hill all day, but they don’t hurt anymore. Being in a community has been very interesting. The group is in a transition, so the rule structure is not as solid as it used to be, plus we are in setup work mode so it is different from retreat time. I have come to value the time spent having a meeting at the beginning of the work meeting and to hold hands and get settled. First there is a sharing of where people are for the day, then we discuss work projects and who is doing what. The conversations that I find frustrating are ones where the groups wants to discuss something that has to be a clear rule – like hand washing for kitchen work. As people arrive, the communication of the basic rules of the community need to be shared and understood clearly and some follow up to correct if misunderstood quickly. I have had some great group projects where we brainstormed and then completed some good work. We have some very interesting discussions along the way. I have learned some new sayings – when there are people from so countries. Carl tells me when we get something to fit very well that it is “like a stocking on a chicken’s lip.” Isn’t that a great one? I have had lots of lovely connections. I had a chakra energy treatment by Sylvia, a Austrian Naturopath yesterday at her nearby house. Laura is going to paint me a flower on a rock. Hara is going to teach us all some Greek today before dinner. She is a local person who is living here for the season. She teaches yoga and is on staff. The Greek alphabet makes signs hard to read and I have not had much success picking up the basics, so I am excited. A lot of Greeks speak English, but I would like to better be able to use the basics of hello, thank you, etc. This entry was posted in Blog on May 23, 2017 by DrValeria. 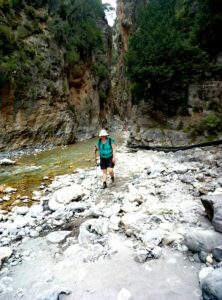 I am sitting in bed recovering from my hike down the Samaria Gorge. It was 18 Km all down hill. Only today did I calculate it out properly and realized it was 11.2 miles! This was like hiking down into the Grand Canyon. Fortunately I did not have to hike back out – we took a ferry from the bottom to a town where our van met us and drove me back near my air BnB. I was not in proper condition for that long of a hike and it ended up being grueling. I had fortunately signed up for a tour to include transportation, so had a guide along to coach me thru it. The ride up and down the windy mountain road in the van was really hard too, since I have motion sickness – I did yoga breathing plus medicine and avoided throwing up- but it took all my attention. It was day of having to be focused the whole time and succeeding despite very difficult circumstances, because I had no other choice, I was committed. It was a reminder and lesson to me about how commitment and focus are important to success. This is a photo of initial steps down. Robbie and I shared pig’s cheeks, cauliflower salad, fresh Gluten free Pasta plus an amazing mutton and artichoke dish. It was amazing food and we got there as they were closing and they were nice enough to still serve us beautifully. It was such a lovely heart connection with Robbie, I truly feel like I have a younger brother now. It has been quiet in Greece, I arrived on Crete about midnight on Wednesday night after travelling all day and had to adjust to another two hours of time change. I slept and read and walked on the beach, not much more for several days. 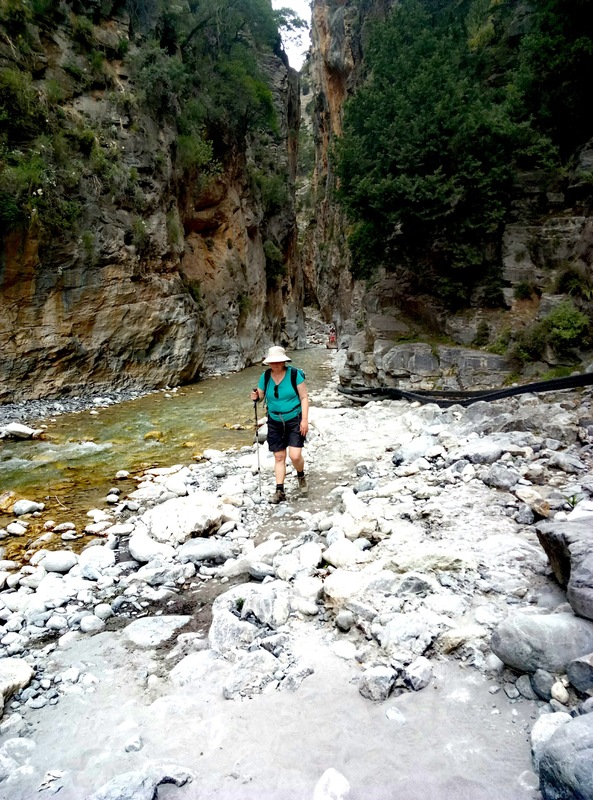 Then I got the brilliant plan together to hike down the Samaria yesterday. This is the best photo of where I am taken from a hill looking back at my airBnB behind the hotels. This area is called Doratsos, a suburb of Chania on the island of Crete. 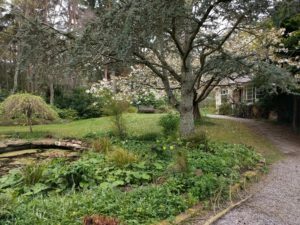 Travelling like tourist is much more expensive and lonelier than visiting friends and staying at places like Findhorn, in community. It is harder to interact with anyone other than service personnel at restaurants, stores, etc. My landlady speaks almost no English. More like a retreat being here. The air BnB is only $300 for 8 days, so Greece is pretty affordable right now. The alphabet characters are different, so label reading for gluten free foods has been tough. Tomorrow I travel towards KaliKalos, a Findhorn related facility. I am going to work there for two weeks helping them set up for their summer retreat season. I expect it will be some lovely new people to get to know and new challenges. This entry was posted in Blog on May 9, 2017 by DrValeria. 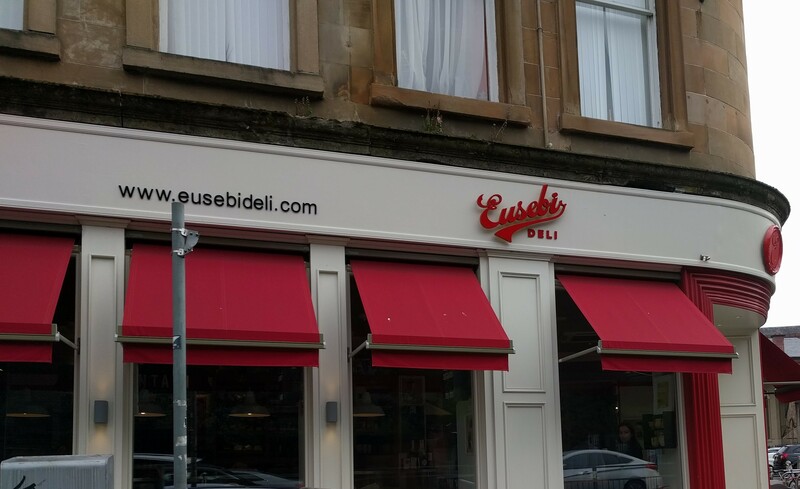 Tonight I am in Glasgow, Scotland writing this. I caught the bus from Forres to Elgin, then a standing room only train to Aberdeen where I transferred to the train to Glasgow. 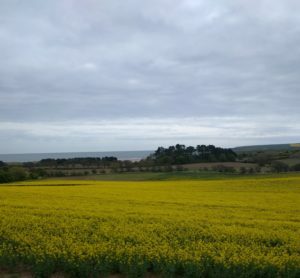 This is photo from the train of flowers and the sea in the distance. I had a wonderful man help me get on the right train to my Air BnB in Glasgow and tell me about what to see in Glasgow. All the museums and botanical gardens are free. The botanical gardens are only a 20 minute walk from where I am staying, so I plan to walk over there tomorrow morning. Maybe have tea. 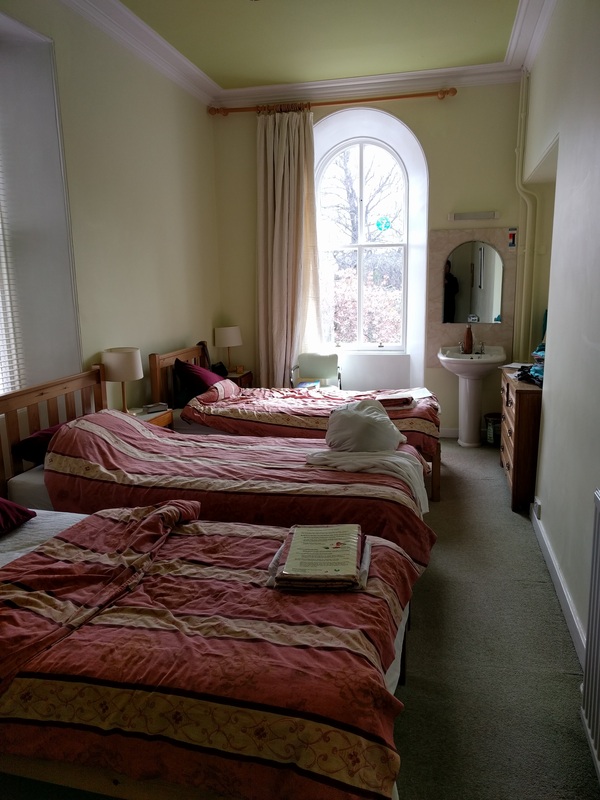 A friend from my first week at Findhorn is managing an AirBnB in Glasgow and offered to let me stay for free since it was empty this weekend. It is on the third floor, no elevator – so glad I have luggage I can carry! There is a wood exterior door – like a shutter with two halves that has to be opened about six inches before the door into the apartment. Figuring out the keys was tricky, but had a nice neighbor man offer show me how when I was not figuring it out. It is a lovely, two bedroom apartment with full kitchen. The washer machine is in the kitchen under the counter, next to the sink, then the clothes are hung in the bathroom on a rack that is lowered with rope down over the shower. Saves on energy use. A version of this rack was in laundry room at Findhorn and in cottage at Erraid, so seems to be a practical drying solution in this damp climate. The spiritual practice, meditation retreat was very good. Lovely people and some interesting meditation techniques shared. We had a twenty-four hour silence with minimal interaction with others, no phones or computers. I found that to be quite powerful and brought me some wonderful insights. One that came up very clearly was that I needed to work for Clean Air, Clean Water and Clean Earth. All of them are essential for our continued well being on this planet. This was one of the lovely meditation gardens at the Park. We had snow two days, so stayed inside those days. I was having some right flank – kidney pain during the week that I identified as probably a kidney stone from doing the ketogenic diet last year. Fortunately it became apparent to me what homeopathic remedy to take. 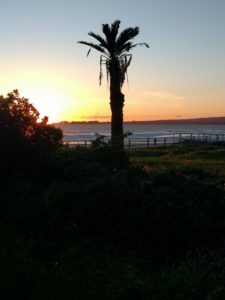 When it became more of a problem, in a meditation I received instruction to spend a couple of hours of drinking lots and lots of water and walking up and down my room. After that I could feel the stone moving down my ureter, a much milder pain. I have not had a problem since the spring before I came to Europe by myself in 1972, when I was 19 years old and in college. Isn’t that an amazing coincidence 45 years later. This was my room this stay, which by good luck I had to myself. On Tuesday, May 2nd, I am catching a flight from Edinburgh to Athens, then over to the island of Crete. I am going to stay in an AirBnB there and will write, visit the beach, hike and visit ancient ruins. This entry was posted in Blog on April 29, 2017 by DrValeria. I am just finishing up my week on the Isle of Erraid. I have enjoyed being with the community here. Wonderful people on this lovely island. The weather has alternated from warm and sunny to cold and gray – it is April after all. We have worked in the gardens planting, I helped with some cooking one day and learned to make a rainbow candle they specialize in here. I had a lovely hike. It was low key with lots of fresh air and wonderful people. 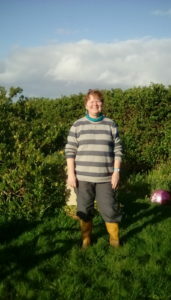 here I am in my yellow Wellies – they were great for the mud and boggy places. This is the inside of the house I stayed in – the wood stoves are the only source of heat – so it was wonderful to sit in front of and read in the evenings. Then I would fill up my hot water bottle and sleep under a very light and warm Duvet in the unheated bedroom. 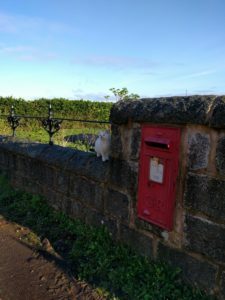 The house had a cat – outside on the wall and old post office box. 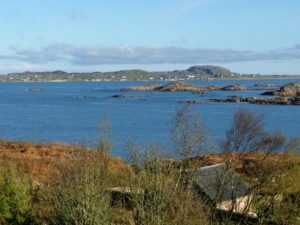 View over the bay from the island, looking toward the island of Iona. 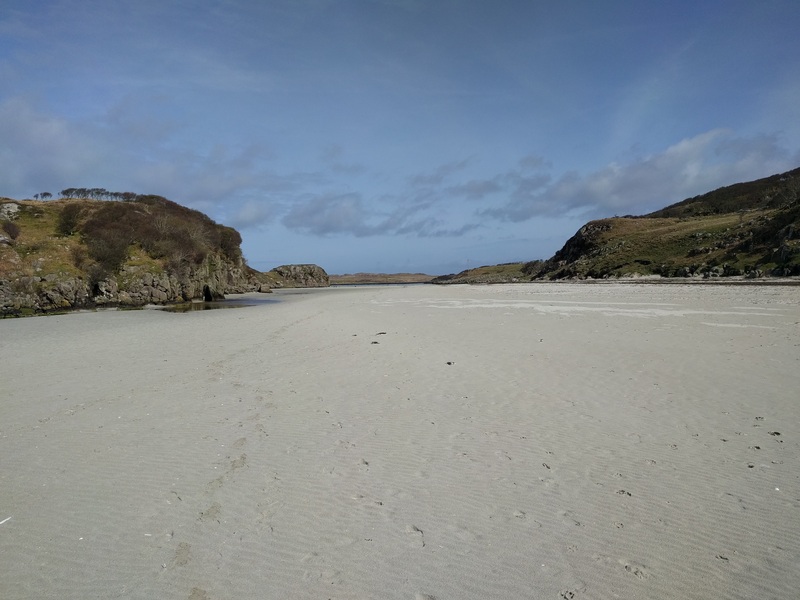 The island has a link to the Isle of Mull that that can be walked over at low tide. If you weren’t paying attention, you might not realize you had crossed over onto the island. It is important to pay attention to the tides to be able to return. My hostess, Beth and Klaire, walked over to her car to go shopping in town one day. I had met a hiker who came onto the island, Vanessa and hiked with her and showed her around the community before she hiked back across. I will say goodbye and be boated across to the Isle of Mull tomorrow morning where I will get on the van for 6 hours ride back to Findhorn on the other side of Scotland. It will be sad to say good bye to everyone. I will join a Spiritual retreat on Meditation at Cluny for a week. This entry was posted in Blog on April 21, 2017 by DrValeria. 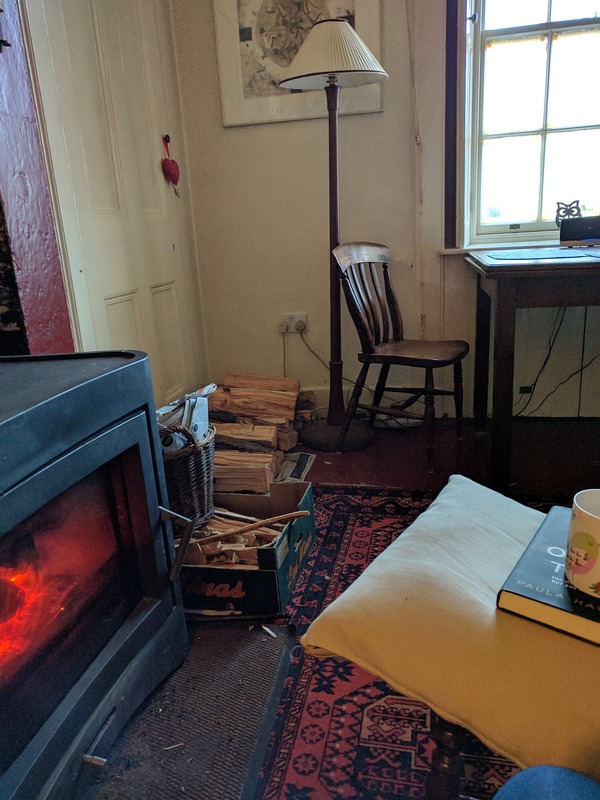 I am writing today from the island of Erraid off West Scotland. I just arrived today from Findhorn Foundation to this affiliated community. It was a six hour drive. The left side of the road driving, roundabouts, narrow lanes with pull outs all made me glad I was not driving! Last week was called Experience Week, and what a wonderful experience it was! It was a wonderful time to both experience Findhorn Foundation (https://www.findhorn.org/) and the sustainable community and eco-village plus a time to better connect in to my heart and with my classmates. My class had twelve members and we all bonded very quickly. It was a wonderful blend of ages and more men than women. I have not been in such a wonderful mixed gender community for a long time. The class was also a lovely mix of English, Scots, French and Spanish – all speaking English with their own accents. It took me a couple of days to really understand everyone’s names – I had to see them in writing to really grasp them. The Experience week process has been very similar for many years and was quite effective, along with our group having amazing focalizers, in pulling a group together as a community. I hope to stay in touch with all of the members of my group and perhaps to visit them during my travels. One of my classmates came to the island community neighboring Erraid, called Iona, for a week. We expect to see each other once during the week. 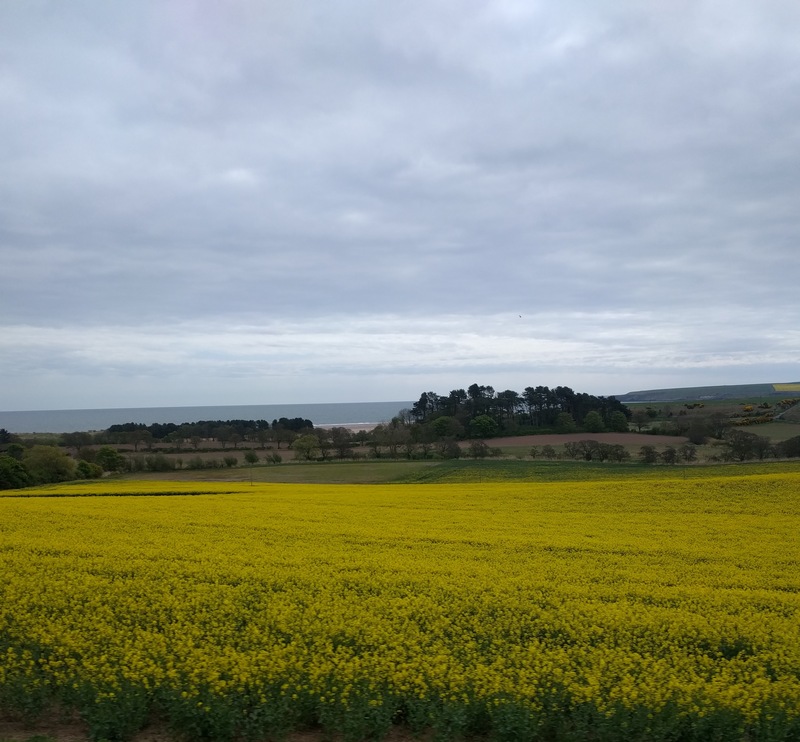 Findhorn is lovely, green grass with yellow Scotch Broom in bloom, Scottish, coastal community, the weather varied between cold windy rain to lovely sunshine. We stayed in dormitory type rooms with the bathroom down the hall for our class in a place called Cluny Hall where our classes were also. We spent a couple of hours a day doing community work, called “Love in Action”. I worked in the kitchen, other classmates worked in the gardens. It was all done at a lovely pace with regular tea breaks. I found the community to be authentic and honest about their problems and possible solutions. They are currently working on revamping their organization to flow easier. I don’t have an urge to live here, but appreciate the good work they are doing. I saw a Living Green Machine that processed their sewage using plants and bacteria so that it met the Scottish standards for reclaimed water. I visited their gardens for flowers and vegetables they are growing and of course dipped my hand in the sea once. I can’t get that close to the ocean without touching it. 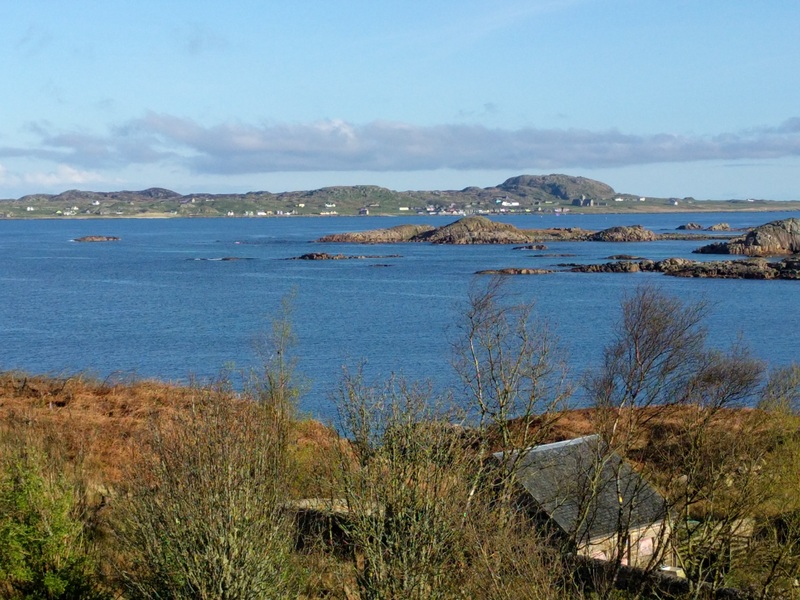 During the Experience week an opportunity to live for a week with a community and share in their life and work came up on the island of Erraid. I decided to take the opportunity and traveled by van across Scotland this morning, leaving Findhorn at 5:30 AM. We are 11 people on the island today and it is beautiful, windy and cold here. We shared a dinner of lentil curry and rice plus rhubarb sauce for dessert. They made a gluten free biscuit and bread to go with it. Another permanent person here is gluten free, so it was easy to add me in. The rhubarb reminded me of my Aunt Gladys’ rhubarb sauce, a little tart. One advantage of the island is I have good internet connection – so I will be able to make calls on Wifi in addition to doing this blogging, email, etc. that I have not been able to do easily for awhile. My phone plan allows me to call free only over Wifi. After this week I am going to do a week of meditation retreat back at Findhorn before I leave for Greece on May 2nd from Edinburgh. I met with the instructor (called a focalizer here) and really liked him. I feel I will be more solid in knowing myself when I am done with these three weeks and in addition have many new, good friends. This entry was posted in Blog, Uncategorized on April 15, 2017 by DrValeria. Here I am in London! The adventure truly begins here. 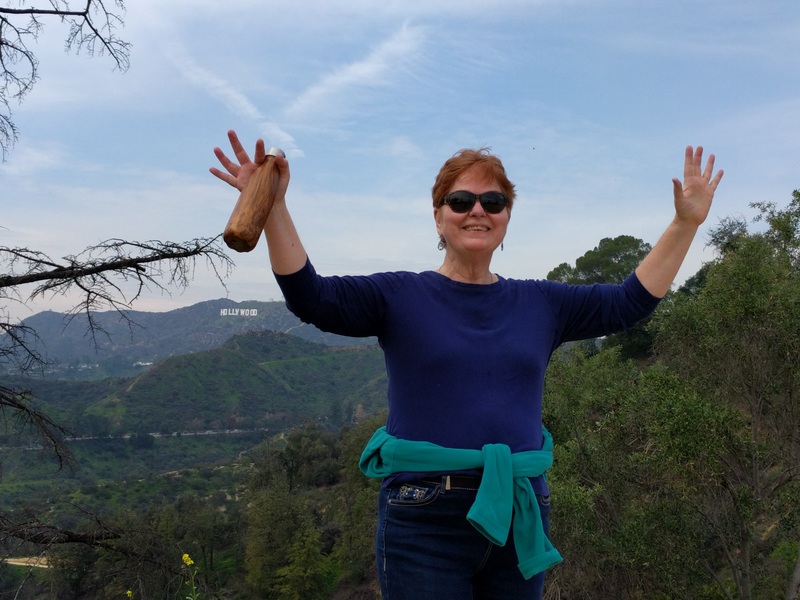 I left Katharine’s, in Ashland, at 5 AM for the airport, flew to LA and rented a car to drive LA county courthouse to visit Lili for lunch. It was a lovely meal in an elegant downtown restaurant. 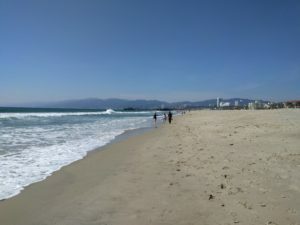 Next I drove to Santa Monica beach for a little walk in the sand and ocean before going back to LAX for my flight, I can’t get close to a beach without putting my feet in. 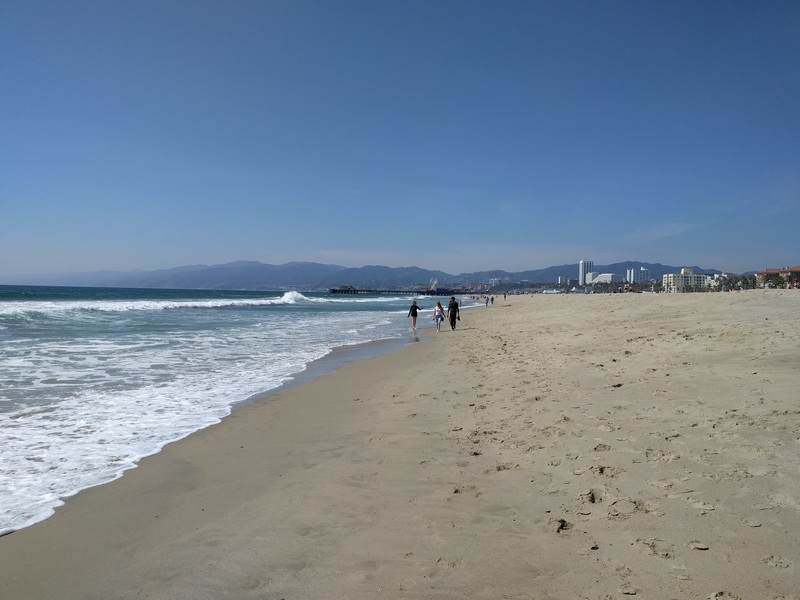 It was lovely sunny day in Los Angeles. Lili took this photo of me when I was through last month at the very beginning. I had thought I would read books on my phone on the plane, but I ended up watching the movie Lion and then the Fantastical Beasts, it was a ten hour flight nonstop. I was pleased to see a couple of movies I had wanted to see. It was very difficult to sleep sitting straight up – I thought with a window seat I could lean against wall, but the configuration of the seats created a gap between my seat and the wall, so no luck. I arrived in London about 24 hours after leaving Ashland with essentially no sleep. The plane food was definitely now gluten free! My eyes were buggy and my head spun – I had to do some walking to catch the right free bus to the Ibis motel. I had a very helpful British Airways staff person who was going to the same bus stop point out where to go. I checked in and fell asleep in the bath and then just crawled into bed. It is a very efficient, well planned room that I prepaid online through Booking.com. I had planned on walking in the sun to acclimate, but did not happen. I did remember to get some Pounds at the airport and studied them this evening so I can hopefully use them wisely. I am planning on using my credit card mostly. Tomorrow morning, at 7 AM, I will catch the iconic, red, double-decker bus back to the airport to fly to Inverness. I am glad I gave myself some time to recover near Heathrow. The advantage of traveling by myself is I can be up and down all night without bothering anyone else. Though I expect to sleep well tonight. I had a very active visit in Ashland staying with Katharine. The spring weather was beautiful. We walked extensively daily, I added on a spinning class and helping to move a huge bark chip pile, so I felt well exercised. Also ate very well, so was ready for the trip. I sorted through my belongings to get my travel things down to all fitting in a carry on suitcase plus my under the seat back pack. It was tough! I tried to just bring the clothes, supplements, etc. that I could not replace easily here. I did gate check my carry on bag at the London flight gate for free – I just was tired of lugging it around all day. Before my London flight, I looked all over through my bag for my back up battery unit for my nearly dead phone, did not find until I arrived at the London motel – just where I thought it was! The good news is the airplane seat back in front of me had my own USB charger port and movie screen, games and flight information, so I did not need charger, just the cord which I did have my hands on. Frustrating to misplace things like that, but it all turned out right in the end. This entry was posted in Blog on April 5, 2017 by DrValeria. I did get my car unburied from the the four feet of snow that fell on it in the mountains near Tahoe. It took three of us and some warmer weather to get it out and chained up. Then I had clear freeways all the way to Ashland, Oregon. 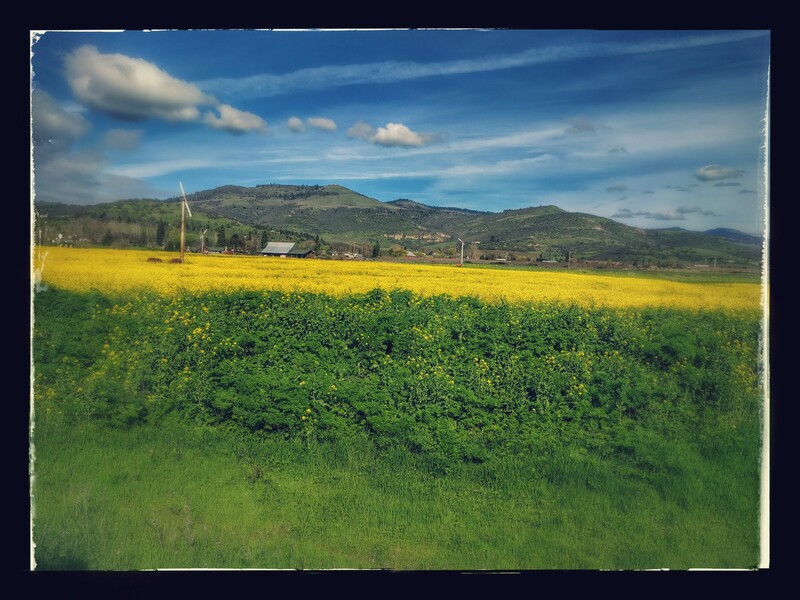 Coming down the mountain into Ashland felt like coming home. 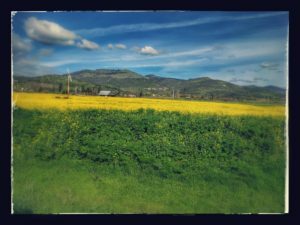 Ashland felt very comfortable. I was able to eat at a couple of my favorite restaurants, Mihama’s and Senior Sam’s. They both had the same menu and feel twenty years later! Made me feel young again. I was not there very long, but had a wonderful time, Katharine had gotten a great deal on tickets to Shakespeare in Love at the Shakespeare festival. It was a marvelous play, very well done. Katharine and I went walking both morning for 10,000 steps as a fund raiser for women with Domi and Meg. Domi is a very experienced backpacker and hiker who has hiked in Scotland. She recommended for hiking in Scotland I purchase a smart wool zip neck sweater and a Patagonia jacket that is light weight, breathes yet is water and wind proof. I was able to sort through the stuff I brought along in my car and make some sense of it. 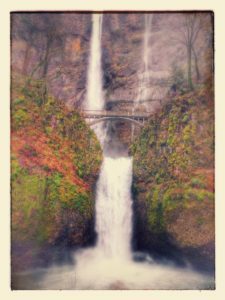 I left a fair amount with Katharine, then headed up the road to Portland. It is a five hour drive, but I drove it so many times when I lived there, it was very familiar and the time flew by. Jo, Shane and I went to an amazing Swiss Restaurant in Portland for dinner one night. Jo and I went shopping for the smart wool sweater and jacket at REI Portland. I wore the sweater every day for the next two weeks! I drove to my cousin Debbie and Nelson’s in Kennewick, Washington next. Stopped at Multonomah Falls on the way. The melting snow and rains created a torrent and also closed the trail to the top. I spent ten days on my cousins Alan and Cindy’s ranch on a spiritual retreat, praying outside three times a day, drumming, singing, sewing and doing Jungian dream analysis with a Lakota Medicine woman, Beautiful Little Dancing Crow. It was a powerful time of owning and re-claiming myself. Here is a link to her message Youtube for our times: Click here. I also learned how to adapt to much colder climate as the snows melted in Hartline, Washington. The snows were melting as I arrived and the mud was fierce! We went hiking and saw the first green emerging, ponds and waterfalls, but I also had to dig out one hiking boot from the mud when it got sucked in to the muck. I slept in an unheated room with lots of covers and two layers of clothes from head to toe. I was really glad to have silk long johns, wool sweater and wool shoes. My last day we had this amazing rainbow that actually doubled itself too. I’ve spent a couple of days in Spokane with Mary and Jan, my internship roommates from long ago! We have amazingly all kept in fairly close contact over the 43 years since our internship. We ate out, went to Beauty and the Beast new movie, walked along the Spokane river, watched an exciting Gonzaga University basketball game at a movie theater and played rummy. Lots of fun hanging out with old friends. 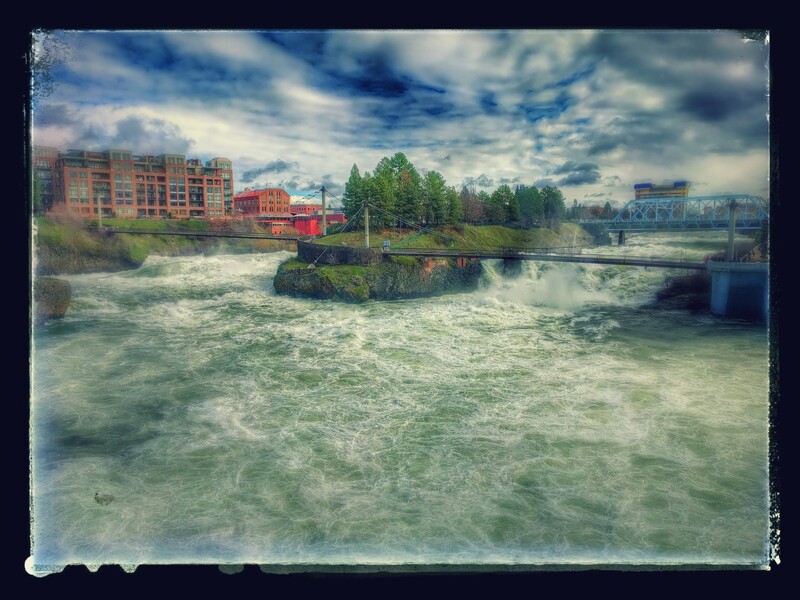 The Spokane river and falls were impressive to see. Tomorrow I am getting an early start driving to Seattle area to visit my cousins Brian and Debbie. Snow is expected on Snoqualmie Pass in the afternoon and I want to be over it before then. This entry was posted in Blog on March 26, 2017 by DrValeria. I am sitting by the fire, snow heaped up high outside the window near Truckee, California. I arrived last night and a big storm is moving in today and tomorrow. My good friends Cathy and Earl have built this lovely place over the past 14 years. It has been wonderful to see the project every year on my visits as it came closer to completion. The three of us met when we were 18 years old our first year of college at Cal Poly, so we are long time good friends! They came to take care of me for my last and worst chemo treatment in December, 2015. We are like family. We are also all making medicare decisions this year. They have been semi-retired for several years, finishing their house has been their work and now it is essentially complete. 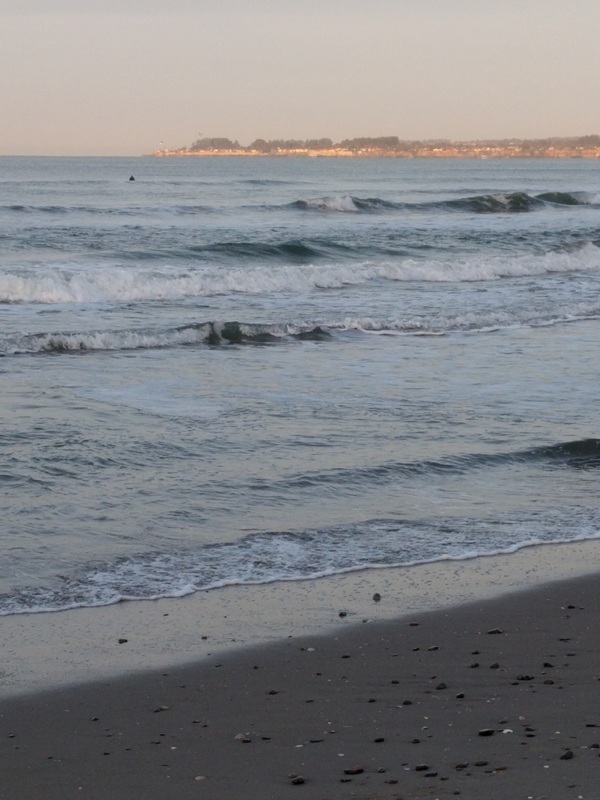 I spent most of the week near Santa Cruz, in Aptos walking on beaches with my close friend Suzi. The sun shone and it was a crisp temperature. I was very pleased to be able to go up and down the beach cliff to the beach easily. Last fall I was huffing and puffing. So I am in better shape for this journey. The fierce weather in February did a lot of damage and brought huge amounts of debris onto the beach. A lot of the beaches were officially closed, but full of people walking their dogs, babies and etc. Everyone just climbed over the barriers to the beach with strollers and all. Aptos was also an opportunity to review what I had brought in my car. I parked my car in Suzi and Larry’s driveway next to her laundry room and we carried in most of my boxes, bags, suitcases and tubs. I had greatly reduced what I was taking in the car the day I loaded the big U-boxes and needed to review what I had along for this journey. I will not see my things in storage until probably November. I could not remember what safe place I had put my passport! I looked through all my bags, tubs and pockets. Finally after a day of searching I went out to the car and looked in the glove box and hurray! It was there. My wardrobe for the next couple of months will be turtlenecks and sweaters, so I made sure they were easily accessible. Visiting my good friends is soothing and helpful. Being near the ocean and up in the snow feeds my soul and brings me joy. A wonderful way to begin this journey. This entry was posted in Blog on March 4, 2017 by DrValeria. "One of the nice things about working with Dr. Valeria is that she has so many tools at her disposal. 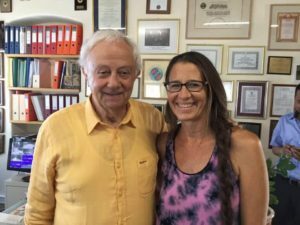 She has helped me, not only with homeopathy, but also with dietary advice, and naturopathic suggestions. She is a caring physician and enjoys every patient."